This waxy cap is less "waxy-cap-ish" than many others, and identification is more likely to get hung up on the genus than the species. 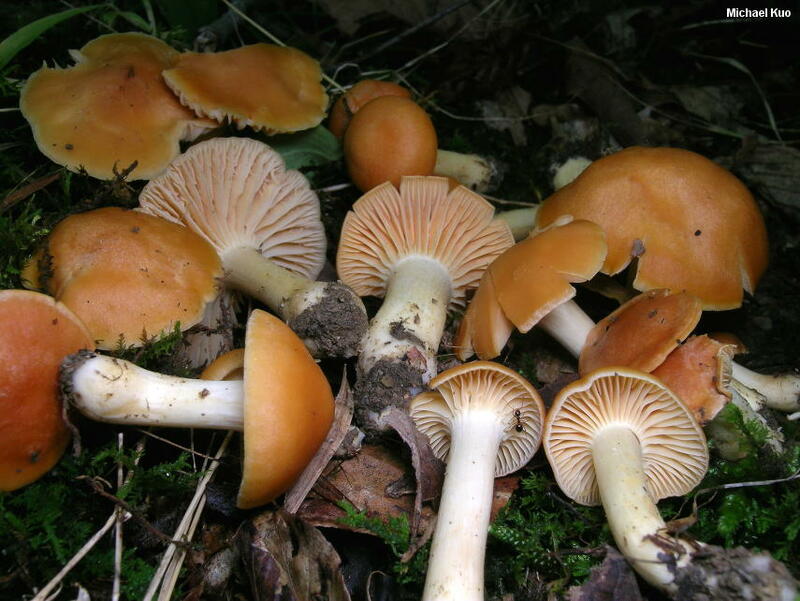 Once you have placed it in the waxy cap family, it is fairly distinctive: crucial identifying features include the dry, brownish orange to orangish buff cap, and the cream to orangish, distant gills that begin to run down the stem. The young caps are, in Mycologese, "appressed fibrillose" (covered with tiny, pressed-down fibers; use a hand lens), giving them a whitish sheen. 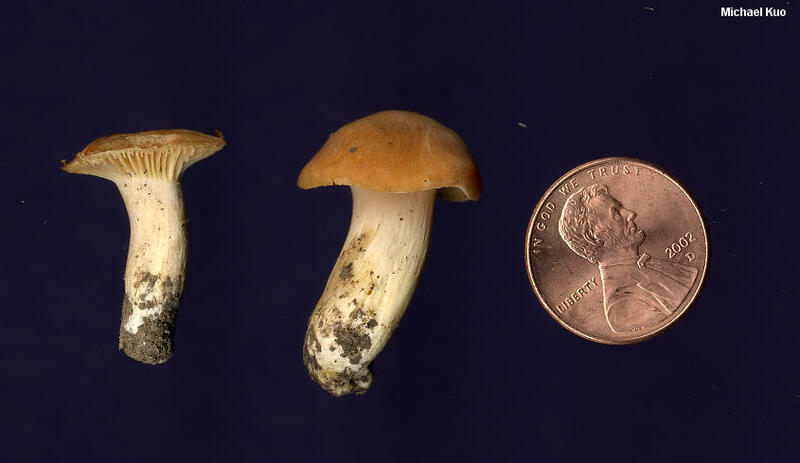 Cuphophyllus pratensis has been shifted between several genera in the waxy cap family over the years, and your field guide may place the species in Hygrophorus, Camarophyllus, or Hygrocybe. But a recent and thorough study of waxy cap DNA (Lodge and collaborators, 2013) supports placing the species in Cuphophyllus. Camarophyllus pratensis, Hygrocybe pratensis, and Hygrophorus pratensis are synonyms. Ecology: Precise ecological role uncertain (see Lodge and collaborators, 2013); growing scattered to gregariously in hardwood or conifer forests; late spring through fall (or over winter in warmer climates); widely distributed in North America. The illustrated and described collections come from Illinois, Québec, and California. Cap: 2-6 cm; convex when young, becoming broadly convex to nearly flat; dry, or slightly tacky when fresh; covered with very tiny, pressed-down fibers (use a hand lens), at least when young--but often more or less bald by maturity; brownish orange, fading to orangish buff; the margin not lined. 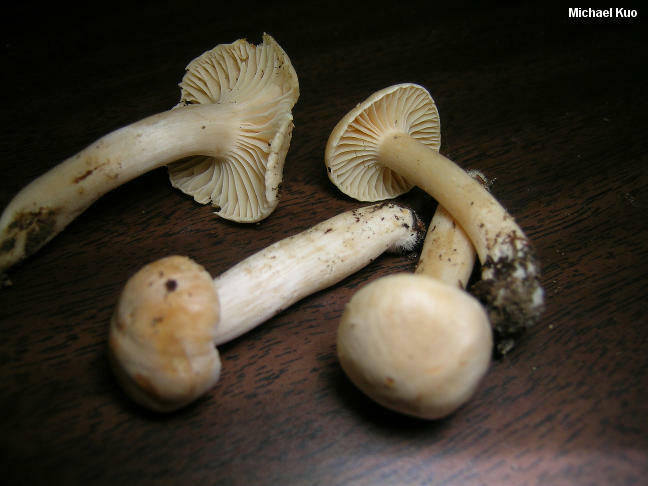 Gills: Running slightly down the stem; distant or nearly so; creamy orangish; short-gills frequent; often with cross-veins by maturity. 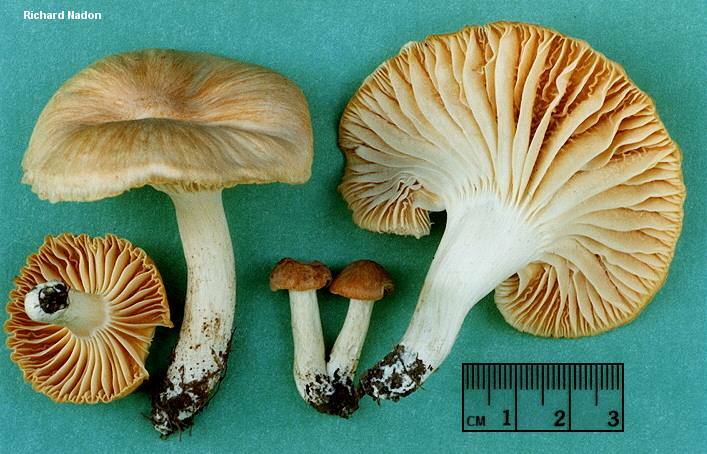 Stem: 2.5-4.5 cm long; 0.5-1.5 cm thick; fairly equal; bald; dry; creamy orangish to whitish; white at the base. Odor and Taste: Taste not distinctive; odor not distinctive, or slightly foul and unpleasant. 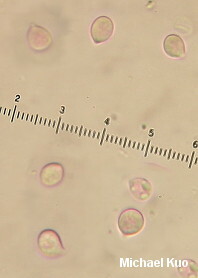 Microscopic Features: Spores 5-6.5 x 4-5 µ; broadly ellipsoid, sublacrymoid, or subglobose; smooth; hyaline in KOH; inamyloid. Basidia 2- and 4-spored; 40-60 µ long. Hymenial cystidia absent. Lamellar trama interwoven. Pileipellis a cutis. REFERENCES: (>Fries, 1818) Bon, 1985. (Fries, 1821; Saccardo, 1887; Murrill, 1914; Kauffman, 1918; Hesler & Smith, 1963; Bird & Grund, 1979; Smith, Smith & Weber, 1979; Largent, 1985; Arora, 1986; Phillips, 1991/2005; Lincoff, 1992; Barron, 1999; Boertmann, 2000; Roody, 2003; McNeil, 2006; Trudell & Ammirati, 2009; Lodge et al., 2013; Kuo & Methven, 2014.) Herb. Kuo 06120302, 06150309, 01150514, 09221202.